Ar Sparfel is a self-catering house with 5 bedrooms, 3 with twin beds,1 with double/twin beds and 1 with single bed sleeping up to 9.. There are two bathrooms, one with bath/shower/basin/loo and one with shower/basin/loo and a separate cloakroom with loo and basin. Internet. A large heated drying cupboard. Dishwasher, Clothes washer. Large living room with seating for 9 persons and dining area with french doors leading to paved terrace with barbeque. Spectacular sea views from house & terrace looking straight out to Les Tas de Pois islands and many lighthouses which can be spotted winking at night. The sunsets are magnificent from the terrace and house. We built it in 1978 at the edge of a tiny unspoilt cliff top hamlet away from noise and traffic approached by a small road that is marked 'dead end' and only for the use of the residents. Ar Sparfel is the last house in the village. The house is easy to keep clean and the beds are made up for your arrival. The rent includes all outgoings and rentals are from Saturday to Saturday. Large safe garden for children to play with large lawn brilliant for ball play. Take the track from the house and the sandy beach is 300 yds 5 minutes walk. 15 mins walk along the cliff path takes you to one of the best surfing beaches in France, Lost Mar'ch. Local facilities include tennis, riding, sailing, wind surfing. There are classes for all ages in Kayaking, Paddle Stand Up Boarding, Sailing and Surfing at the Centre Nautique de Crozon-Morgat (see their website). Drive 8 mins to the market town of Crozon with its weekly fish and veg market, shops, supermarket and pretty square with church and cafe which has Internet available. And same distance to the seaside sailing resort of Morgat. 40 mins to the medieval city of Quimper with its wonderful cathedral and Quimper Pottery factory tours as well as cafes, bars and restaurants. Many seafood restaurants in the area and an abundance of sandy beaches. Our village, Kerabars, is 65 miles from Roscoff, 160 miles from St. Malo, 280 miles from Caen and 270 miles from Cherbourg. The area is beautifully mild in the winter and the house is double glazed on all windows, a fireplace for burning driftwood and heating in every room. The Countryside: From Ar Sparfel you look out at a spectacular view of the Atlantic, the Tas de Pois (islands) and the Point de Dinan. A 5 minute walk, from the house down a track takes you to our beach which is ideal for surfing, collecting mussels at low tide with many rock pools for children to play. There are wonderful cliff walks in either direction. The peninsular has a temperate climate. In the mild spring, gorse and broom flare golden and there are carpets of primroses and wild flowers. From June to September it can at times get incredibly warm. In the autumn the cliffs are covered with purple heather & gorse. The villagers say snow is unknown and frost almost as rare. The little Port of Morgat is 8 minutes drive away and Crozon, the market town, the same distance. Things to do: Eating at the little seafood restaurants is a great experience. You will be faced by Plateau des Fruits de Mer, Coquillages, Crabes and Crevettes and home seems far away! To work off the excesses, Golf is 40 minutes away at Golf de Brest Iroise with 18 spectacular holes. Diving Clubs, Windsurfing and Sailing abound at Morgat and Camaret, a well known port to English sailors 15 minutes away. There is so much to offer from small children to teenagers. Tennis with all weather courts and indoor court and bicycle hire at Morgat. Shopping is terrific at Crozon and Morgat. There is a fish and veg market most mornings in Crozon, 3 supermarkets and everything one could ever want that is French! Quimper, 40 minutes away, is a fascinating cathedral down and the home of the famous Quimper Pottery Factory. The medieval town of Locronon with its ancient church is 35 mins drive. Annabel Ridley is an artist and glass engraver. Having holidayed with our 3 small children several years running, we found our favourite beach at the end of a country lane leading to nowhere except for a small Breton hamlet. We bought a field overlooking the sea and in 1977 built a house where we have spent our holidays every year since. Spectular sea view. Internet. Terrace to watch sunsets. Close to many sandy beaches. walking for 20mins from our house takes you to the famous surfing beaches of La Palud and Lost Mar'ch where the annual Surfing Competitions take place. Attractive countryside and small farming villages. Our sandy beach is 5 mins walk from the house. The house is set back from the cliff paths and is in the area that is a designated area of beauty. A 20 min drive takes you to Camaret, the French Port where there are many seafood restaurants. I is a family house sleeping 9 with two bathrooms, separate cloakroom and large drying cupboard & ouside line. Large grassed garden area for children to play. The house is the last one in the village up a dead end road designated to the residents so its very quiet with no dangers of passing traffic. Our beach is uttely uncrowed consisting even in High Season of mostly the residents in the village and us! Masses to do for young children and teenagers. There is a brilliant Nautique Centre de Crozon-Morgat at Morgat where you can fix up classes in just about everything nautical! You can go riding along the beaches with the local riding school or bicycling along the cliff paths. The walks are absolutely magnificent and at all times of the year the gorse or heather seems to be out. Large heated airing cupboard for drying clothes. The two bathrooms refurbished including walk in shower February 2019. There is an excellent Golf Course near Brest. The medieval city of Locronon and Quimper, with its beautiful cathedral, are nearby. Mountain Bikes can be hired in Crozon. Riding stables in Morgat and tennis courts. There is a diving school in Camaret and Sailing and Windsurfing school in Morgat plus a swimming pool with flumes. 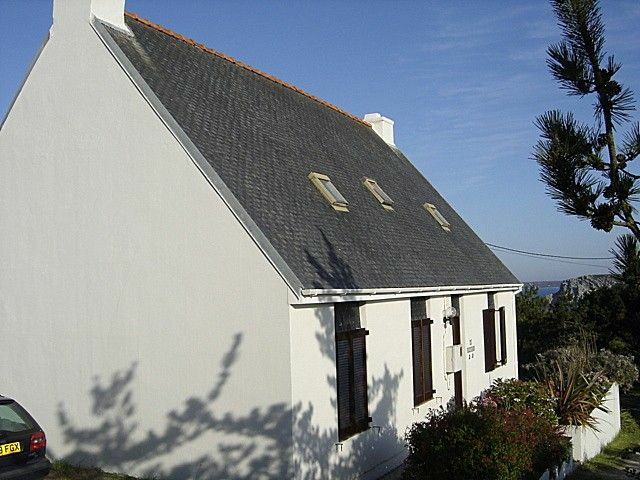 The house was built in 1978 and is at the top of the site commanding spectacular views over the Tas des Pois, a group of islands beyond which are the Isles of Ushant and many lighthouses which can be seen at night. You can stand on our Patio and watch the sun going down behind the islands. The garden is large and mostly mown grass and excellent for footballs and games for children when not at our beach - five minutes walk away. You can walk out of our house to the cliff path where you can enjoy spectacular walks in either direction. Our small village is typically Breton and at the end of a quiet road so there is no through traffic to disturb you. Perfect house for our family reunion. Next to miles of hikes and close to the beach. Plenty of room to spread out and homey too. I'd go back tomorrow if I could. Wat een geweldig huis op een unieke locatie !!!!! What a magic situation, right at the end of a lane with no other houses between you and the sea. A short walk to the beach which even in August wasn't crowded. Lovely walks. Great time and hope to go back! Thank you so much for writing about our house and its wonderful situation. What a magic position at the end of a lane with nothing between you and the sea except for cliffs. Short walk to a lovely beach that was uncrowded even in August. I hope to be able to go again. We spent a very enjoyable week at Ar Sparfel in October with our 1 yr old. The house is a cosy (but deceptively large) traditional family holiday home with everything you need for a week or two of vacation. It has a quirky and endearing charm which is obviously steeped in family history, and the place is made really special by its incredible location on the clifftops and set in its expansive garden with a glorious sea view. We really enjoyed walking, surfing and swimming all within a few paces from the front door, and taking cafe lunches in nearby Crozon and Morgat. The only negative would be that the steep open-tread stairs are not very safe for toddlers (although there is a panel which can block them off at the bottom). It might also be nice to have a couple of double beds for couples, and also wifi access. None of these things bothered us especially as we were there for a proper family getaway - and all in all, it's a great spot for a relaxing and exhilarating holiday. We certainly plan to return. Thank you to our kind hosts who made us very welcome. the surroundings, atmosphere and character of the place is perfect for any family or single persons holiday get away. I cannot put into words how much pleasure the place gave me when taking my friends and family for a 10 day holiday retreat. there is a lovely town called Crozon not to far away where all your needs for supplies and interesting things to do are met. Its peaceful and refreshing if you want to relax with mixed sunny but always warm weather. If you want to participate in more exciting or cultural activities there is a maze, treetop climbing and a paint-balling site less than 5 mins drive away. Morgat and camerat supply more beaches and shops aswell as fabulous painting/drawing sites and views. There are many cultural marvels to be enjoyed, including caves, churches museums, aquariums and many more that I plan to visit on my next visit for sure. if you are looking for sporting activities then there are a number of very well managed sport venues within a 30 minute drive. these include; indoor/outdoor tennis courts near crozon, many golf courses with great reputations, sea school (sailing ect), swimming (flumes), go-karting skating parks. Overall this place gave myself and friends the best holiday for the cheapest cost we've ever had. thank you so much and I know we'll be back! The listing description was very accurate if not it understated the place. Thank you so much for submitting such a lovely review. Our family, children and grandchildren, love the house and its surroundings so much that it is wonderful to know others feel the same! When we chose where to build the house in 1978 we had no idea exactly what to expect and now we feel it was the best decision we have ever taken!. The Ridley Family. Ar Sparfel is the last house where the small road ends in the tiny village of Kerabars. It is very quiet with no through traffic. An eight minute drive away is Crozon, a flourishing market town with supermarkets, church, picturesque square and many shops. The same distance is Morgat, an attractive sea port with shops, seafood restaurants and many sporting facilities - diving, surfing, sailing, paddle boarding, kayaking and windsurfing school at the Centre Nautique de Crozon-Morgat (look up their website) perfect for children of all ages. The beach and sea is sheltered being on the Bay of Douarnenez and facing South. A scenic cliff path goes right from the house in either direction to other wonderful sandy beaches. A short drive away is the medieval town of Locronon and a little further on Quimper, the capital of Finisterre, and the famous Quimper Cathedral and the Breton Pottery Factory. The Port of Douarnenez and the famous sardine fishing fleet is not too far away. Cameret is 15 mins drive from where you can catch the ferry for a day trip to The Isles of Ushant. Golf: Golf de Brest Iroise is roughly 50 miles drive from our house. 18 and 9 holes it was designed by British Architect Michael Fenn in 1976. In a park of 220 acres. Clubhouse has all facilities with agnificent views of Monts Aree and Brest Harbour.